Brice Griffin is a post-abortive stay-at-home mother of four amazing children. Through the sacrament of Reconciliation, along with counseling from her priest and eventually a Rachel’s Vineyard retreat, she has found healing from the years of suffering from the trauma of her abortion. In a profound example of redemptive suffering, she has used her grief as a means to motivate her in her pro-life work. In 2011, NC Governor Bev Perdue vetoed what came to be known as the “Woman’s Right to Know Act.” This act would enforce a 24-hour waiting period, and would also require an abortionist to show a patient an ultrasound with “a simultaneous explanation of what the display is depicting, which shall include the presence, location, and dimensions of the unborn child within the uterus” and “a medical description of the images, which shall include the dimensions of the embryo or fetus and the presence of external members and internal organs, if present and viewable.” In July of 2011, when the North Carolina General Assembly was deciding whether an overturn of the veto would be appropriate, Brice wrote to a handful of Senators and Representatives who were on the fence. When Thom Tillis, the Speaker of the House, caught wind of Brice’s testimony, he asked if she would consider sending it to the entire NC Senate and House of Representatives. Eager to help in any way possible, she sent nearly 200 emails and later that week, the Governor’s veto was indeed overturned, with the “Woman’s Right to Know Act” going into effect in October of 2011. Brice first shared her testimony publicly in front of hundreds at the Charlotte March for Life in January of 2012. It has been published in the Catholic News Herald, and as a result, dozens of strangers and friends have reached out to her for help in their own healing process. 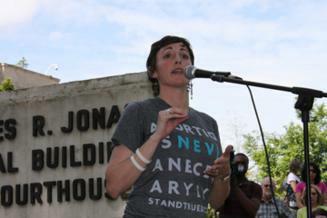 She is active in the Charlotte 40 Days for Life campaign and is working with national and local pro-life leaders to secure a pro-life presence in Charlotte during the Democratic National Convention. Brice and her husband Mike are active parishioners at The Cathedral of St. Patrick in Charlotte, North Carolina.